Fans of Brian K. Vaughn and Fiona Staple’s amazing Image comic book series SAGA will definitely want to stop by the Skybound booth at San Diego Comic-Con next week. 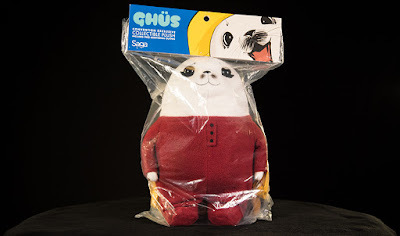 It’ll be the only place to pick up this super adorable San Diego Comic-Con 2017 Exclusive Ghüs Plush Doll! Who doesn’t want a cuddly version of SAGA’s seal man!?! Limited to 500 pieces, the Ghüs Plush Doll includes 3 costumes and retails for just $40 at the Skybound SDCC booth #2729.